Finding the right grow light for you and your plants is a daunting task. But, if you’re looking at the G8led 600, you’re on the right track. When you need lights in your grow room you want a great value. High Times and many other magazines acknowledge the G8led 600 for its value and power. The G8led 600 is great in a grow room, tent or confined space. We cover all the basics here to help you decide if the G8led 600 is the best grow light for you. This company focuses on delivering products that are coveted by professional growers, and reasonably hobbyists. When you’re growing indoors, you have to take care to ensure your lights deliver all the benefits your plants need. The G8led 600 specifically uses design to provide a substantial amount of coverage. Although the bulbs only use 380-watts, they deliver a substantial amount of coverage. 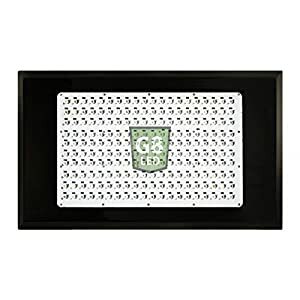 The G8led 600 is suitable for up to 10 mature plants, but it works best with 5-7 plants. Generally, the G8led 600 overs 20 square feet of coverage but towards the edges, you will see some light dispersion. This light is heavy. The G8led 600 weights over 22 pounds, so it requires a substantial amount of support. Dimensions of the G8led 600 is 21 inches long by 14 inches wide and 3 inches deep. Although the G8led 600 weighs a lot and is fairly large, it’s very efficient in energy consumption. The G8led 600 is 8 years in the making as G8LED develops lights on a consistent basis. The open-mindedness of the company allows them to make every improvement possible. From 380nm to 780nm G8LED offers a wide color ratio spectrum. These lights focus on delivering parts of the light spectrum that your plants need for photosynthesis. G8LED delivers infrared, 6000K white, blue light, and ultraviolet rays to promote the best growth from your plants. The cost of any grow light is a major concern for both hobbyists and professional growers. The G8led 600 operates for less than a dollar per day if you follow standard lighting practices. During the vegetative state, the recommended light time is 18 hours per day, while the flowering state only calls for 12 hours. Either way, the G8led 600 uses far less power than HID alternatives. Its long lifespan offsets the initial cost of the G8led 600. The G8led 600 should last you 8-10 years without needing to replace bulbs. You can save yourself hundreds of dollars in replacing the lights every few years. Unlike many other LED light manufacturers, G8LED has superior customer service and includes a 2-year warranty on this product. The 2-year warranty covers all manufacturer defects, as well as standard wear and tear. The customer service is exceptionally easy to work with as their reps are attentive and quick. Calling their customer service line, you can quickly put in your warranty claim or express your concern, and they work to resolve it immediately. The G8led 600 was one of the best lights to come out in the past few years; it’s been recognized for its excellence. But, many professional growers have put out their own opinion, and we have ours. Firstly, the G8led 600 is energy efficient. With its blue light, ultraviolet and infrared rays it produces high-quality buds with large yields. The G8led 600 spreads this light over a large coverage area of nearly 20 square feet with 8 bands of light. But, this light has an unreasonable price. If you plan on growing for the next 10 years, this light in an investment. You’ll save money because you won’t need to replace the light after a few years, and also on your electricity bills. Over the course of years, this is a quality investment. The G8led 600 is worth every penny as long as you’re a professional grower. But, if you’re a hobbyist or new to growing you should try a smaller and less expensive light. There’s a 2-year warranty involved, and G8LED is well-known for outstanding customer service. The initial cost is much higher, but you’re paying for long-term use, customer service, and undoubtedly, quality. If you need a, grow light to improve your yields the G8led 600 is an option. It offers low heat which helps control the temperature of your grow room or tent, but it doesn’t have a cooling system. The G8led 600 delves about 5 feet into your plants as they reach their bloom. There’s no concern of your plants outgrowing the light. The only downside is that there isn’t a significant amount of red light. Recently growers have worked with a red light to increase bud growth and potency. There’s nothing to back up these claims yet, but many professional growers are reporting positive results.